“I'm eternally grateful to the doctors at NewYork-Presbyterian Queens. They thought outside the box and saved my leg." 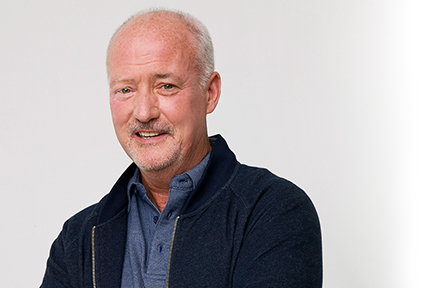 As an executive chef at one of New York City's most prestigious clubs, Tom Meyer was accustomed to navigating high-stress situations. To help wind down after a demanding workday, he would ride his motorcycle home. "Riding my bike was my release," he recalls. "it was the highlight of my day." Yet that all abruptly changed one September day, when the driver of a vehicle ran a red light, striking Tom and totaling his bike. The collision flung the 56-year-old married father of two into the air and onto the street, where he landed on his back. The next thing Tom remembers is speaking out loud. “You’re alive,” he told himself. Miraculously, Tom survived the impact. But his left tibia and ankle were completely shattered, and he had sustained serious trauma to the main artery in his leg. Emergency personnel quickly transported Tom to NewYork-Presbyterian Queens-one of only a few hospitals in New York State recognized as a Level I Trauma Center by the American College of Surgeons. There, doctors raced to restore blood flow to Tom’s leg and relieve pressure on his calf muscle. The initial prognosis for his leg was grim—amputation above the knee was likely. Thankfully, Tom’s NewYork-Presbyterian Queens medical team—led by Elan Goldwyn, MD, Director of Orthopedic Trauma Surgery, and Elizabeth Sieczka, MD, a voluntary faculty member of NewYork-Presbyterian Queens practicing plastic surgery—never gave up and developed a comprehensive plan to save his leg. Dr. Goldwyn carefully reset Tom’s shattered tibia and ankle piece by piece. Then, Dr. Sieczka used Tom’s latissimus dorsi muscle—the large flat muscle on the back—to replace his calf muscle, which had been lost due to a lack of blood flow. Remarkably, following the 12-hour operation, Tom woke up with both of his legs. Have you planned a few resolutions for the new year but have doubts you will keep them? If so, you are not alone. According to U.S. News & World Report, approximately 80 percent of people who make New Year’s resolutions will abandon their goals by the second week of February. Do not give up! 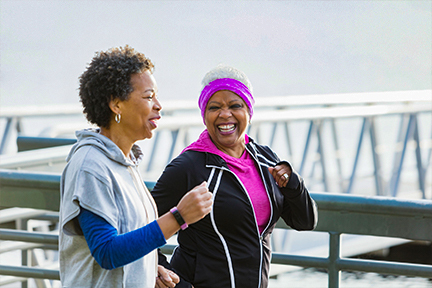 No matter your objective—whether it be to lose weight, save money, stop smoking, or anything else—there are simple steps you can follow to help stay the course. 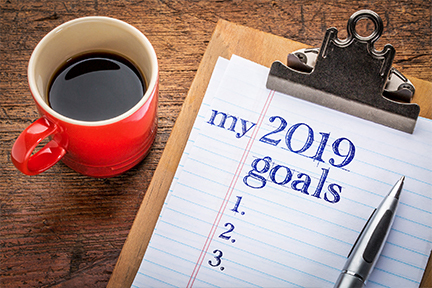 Gail Saltz, MD, a psychoanalyst at NewYork-Presbyterian/Weill Cornell Medical Center, outlines five strategies to help make your New Year's resolutions stick. Read them here. As winter settles in and temperatures outside dip below freezing, why not warm up with our delicious Moroccan Chicken With Chickpea and Lentil Stew? 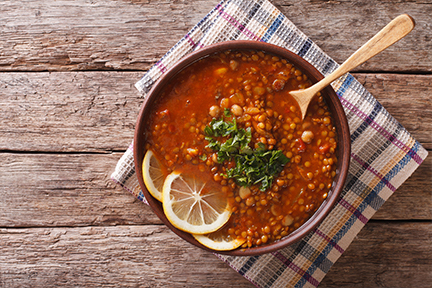 Packed with lentils, kidney beans, and chickpeas, this dish is an excllent source of fiber at 13.5 grams per serving and protein at 40 grams per serving. With the rush of holiday parties, family events, and shopping trips now over, many Americans are recovering from the effects of reduced exercise, overindulgence in seasonal foods, stress, and a lack of sleep. The beginning of the New Year is a great time to “reset” and improve your overall health habits. And by incorporating a few simple changes into your routine, you will be on track to a healthier lifestyle in no time.